The Gravity Storage will be built using methods and techniques already known from the mining and tunneling industry. The objective here, however, is not the removal of the raw materials (as in mining) or the removal of the stone (as in tunneling), but rather the preservation of the rocks. 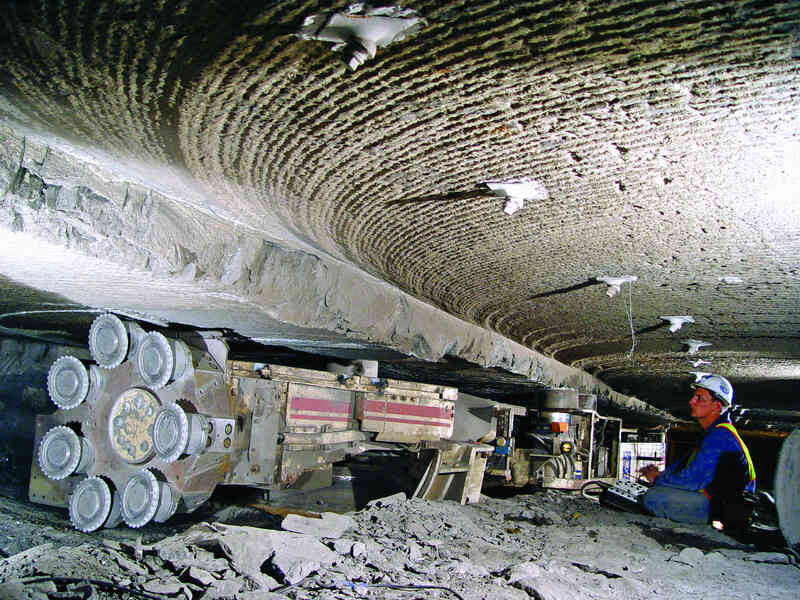 In any event, tunnels or shafts must be installed in which vehicles and people can be transported to the bottom of the piston, so that they can setup the technical equipment. The piston is exposed using circular milling so that there is approximately a 2-3 meter distance between the outer surface of the piston and the shaft, in which the piston will later move. Therefore there is enough space so that this region is accessible and can be supplied with seals (geomembranes, metal cladding). For mechanical reasons, the easiest way to expose the trench between the piston and the shaft is from above. After the upper loose rock has been removed by digging, a stone mill operates continuously in a downward spiral. In parallel to this, the top surface is stabilized, if necessary, and coated with metal or geomembranes. Depending on the depth of the construction, the bottom surface of the piston is reached after a few months. The last few meters can be broken through from below so that the structural safety is maintained for the personnel and machines. The separation of the piston base from the underlying rock is a particular challenge. It is based on the well-established “bord and pillar” method of mining/extraction, with a series of parallel tunnels excavated as a first step (the remaining rock between the tunnels supporting the weight of the piston). 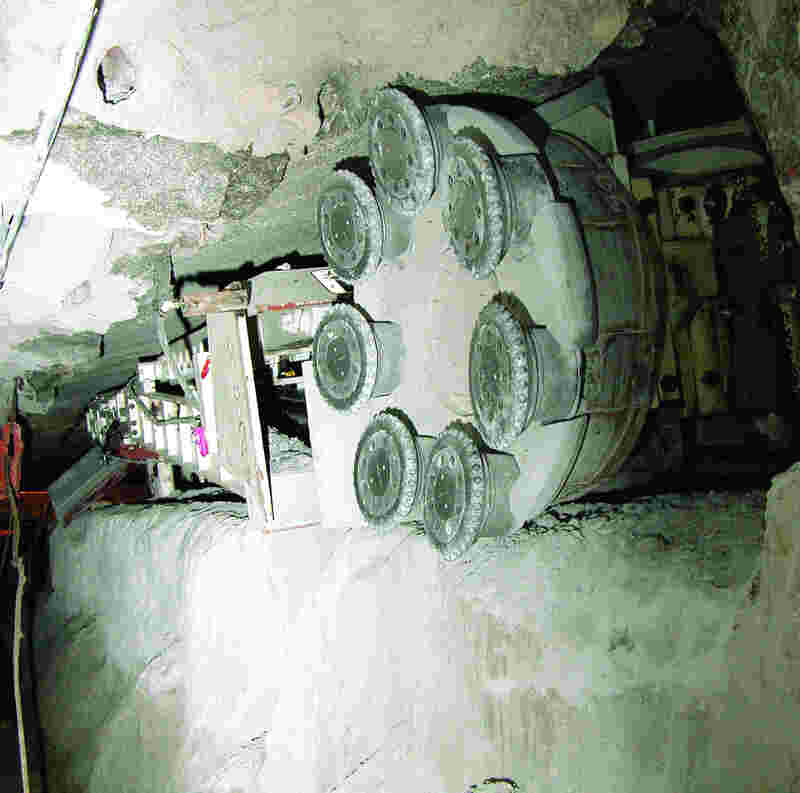 Reinforced concrete pillars, split at mid-height to allow the piston to be raised in service, are then constructed at regular intervals along each tunnel, enabling the remaining rock to be excavated thereafter. As an alternative to the excavation of the whole rock mass beneath the piston, where appropriate for the given geological conditions, the remaining rock between the tunnels may be split at midheight as illustrated in center fold.